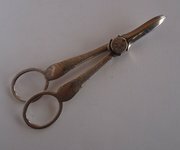 DescriptionA lovely pair of antique, late Victorian English Sterling Silver Grape Scissors made by Martin, Hall & Co at their Shrewsbury Works in Sheffield. They are hallmarked with the maker's mark "RM/EH" for Martin, Hall & Co (Richard Martin & Ebenezer Hall), the Lion Passant sterling silver mark, the Sheffield town mark and date letter "h" for 1900/01. The top side with engraved decoration, the underside plain silver. They are in very good condition. They measure just over 5" inches (130mm) in length. The weight is 53.9g.